VANCOUVER, British Columbia, June 28, 2018 (GLOBE NEWSWIRE) -- Aben Resources Ltd. (ABN.V) (ABNAF) (E2L2.F) (the "Company") is pleased to announce that the drill is now turning at the Boundary North Zone discovery at the Company`s 100% held 23,000-hectare Forrest Kerr Gold Project located in BC`s Golden Triangle region. Aben`s 2018 program will encompass a 5000-metre diamond drilling program in approximately 18 holes with the potential for program expansion. The initial focus of the 2018 drill program will be to expand the high-grade precious metal mineralization discovered in 2017 at the Boundary North Zone, located near the center of the Forrest Kerr Property. Three separate drill holes, collared from the same drill pad, pierced a near-surface high-grade zone of gold-silver-copper mineralization, in addition to broad intercepts containing gold bearing quartz veins. Based on last year`s drilling, field work and historic drilling, the Company believes this mineralized zone is trending and open to the northeast and the southwest and is open at depth. Select results from those holes include 6.7 grams per tonne (g/T) Au, 6.4 g/T Ag and 0.9% Cu over 10 metres, including 18.9 g/T Au, 16.6 g/T Ag and 2.2% Cu over 3.0 metres in hole FK17-04 which contributed to an average grade of 0.26 g/T Au over 387 metres. Hole FK17-05 returned 21.5 g/T Au, 28.5 g/T Ag and 3.1% Cu over 6 metres from the same zone at a slightly greater depth. 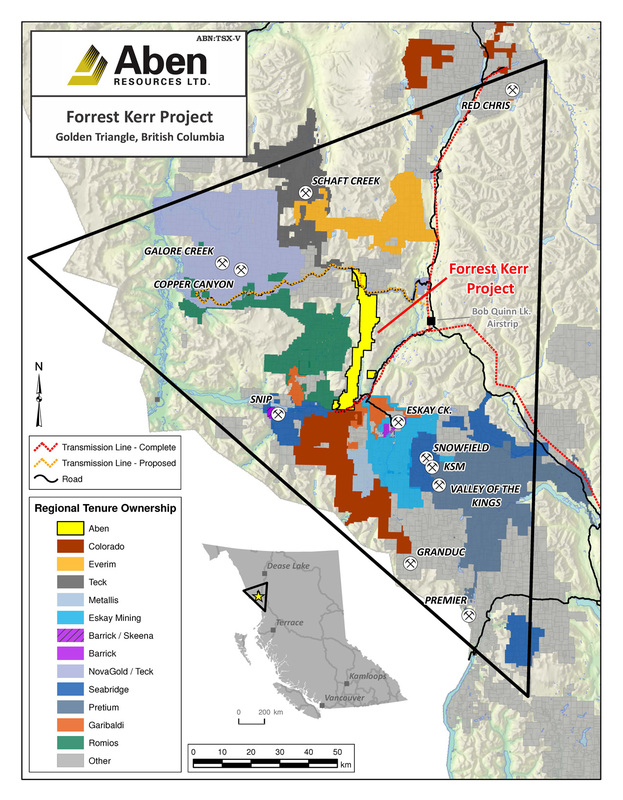 Aben President and CEO, Jim Pettit, stated: "Notable regional discoveries by Pretium, GT Gold, Garibaldi Resources, Snip, and others have illustrated the significant discovery upside remaining in the district and we are confident in the potential at Forrest Kerr given the newly discovered and historic high-grade mineralization there as well as the numerous untested gold-in-soil anomalies present."